Two of our Y6 children, Lewis and Will were awarded special awards during an assembly in mid-July. The boys scored the highest ever, and second highest ever scores in the Rural Schools Sports Partnership decathlon event. 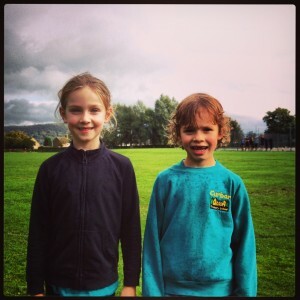 They have now been invited to the gifted and talented academy in the Summer holiday along with Ellen and Henry. Well done guys! Once again. 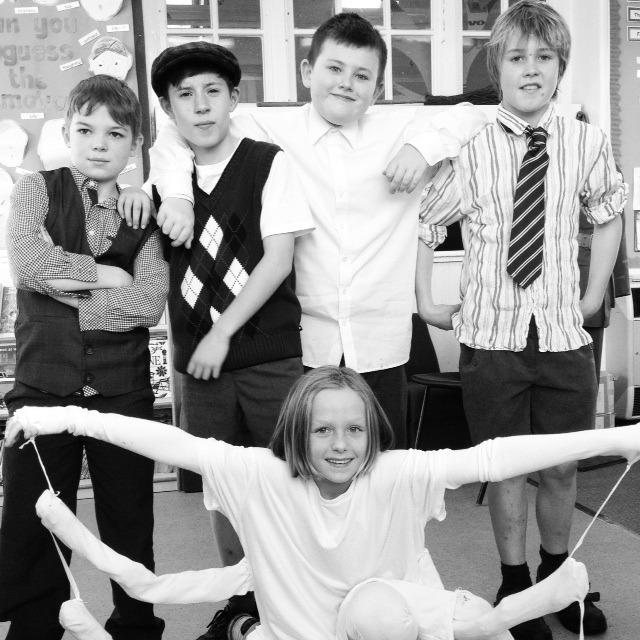 Class 3 participated in the annual Greenaway project at Lady Manners School library. The children enjoyed working with children from other schools and discussed the books on the short-list. 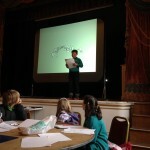 It was great to see the confidence of our children as they spoke in front of the group. This year, we were delighted to host two Sports Afternoons on our brand new MUGA facility. The coaches from Extratime organised the activities and parents watched from the area outside the MUGA. Many thanks to everyone for their support. In early July 2015 Class 3 children ventured off to the White Hall residential centre near Buxton for three days and two nights of outdoor and adventurous activity. 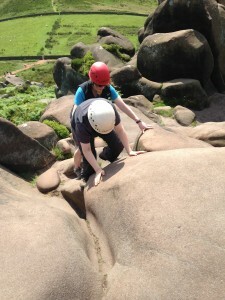 The children had great fun via a wide range of activities, including abseiling, climbing, kayaking and stream-scrambling. A huge thank you to Miss Gregory, Miss Pattison and Mrs Patterson for giving up their time and energy. Thanks also to Mrs Rumney for her organisation. Please see our separate page on the White Hall visit. Please click on the link (above) to view our new MUGA being enjoyed by Class 3 at lunchtime. 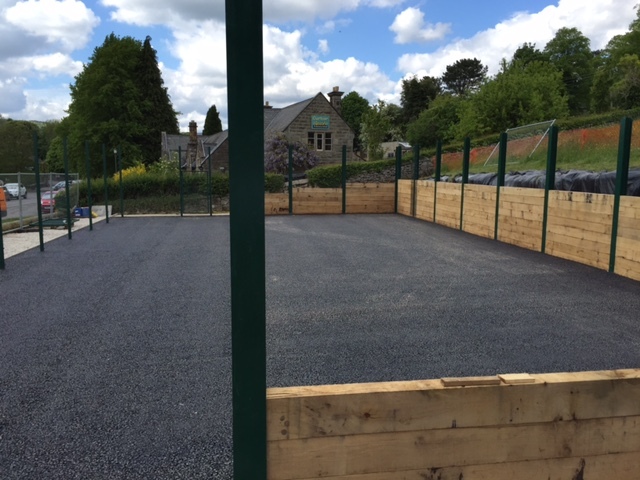 We will be starting organised lunchtime sports clubs on the MUGA very soon! 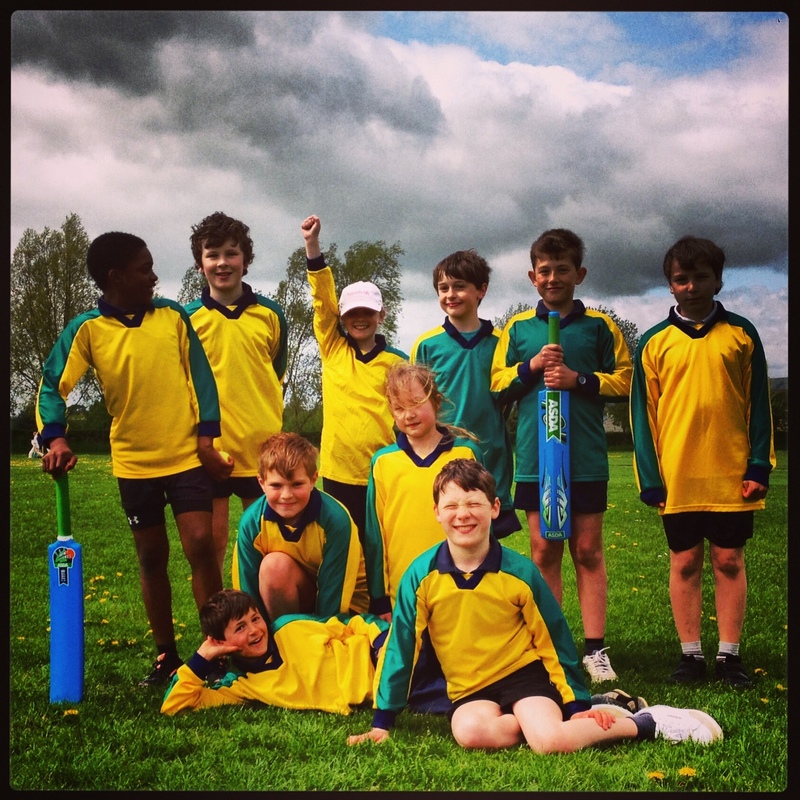 Our fabulous squad of cricketers travelled to Darley Dale on June 10th for the Rural Schools Sports Partnership kwik cricket finals. The competition was strong but the team won all three of their games and were crowned Champions! This is another fantastic achievement for our small school. Unfortunately, the next round of the series is on the same date that the squad is at Whitehall. However, we are very proud of their achievements and the team are very proud of their medals and certificates. Look out for pictures in the RSSP newsletter! Our brand-new Multi-Use-Games-Area is now being used by the children and staff. 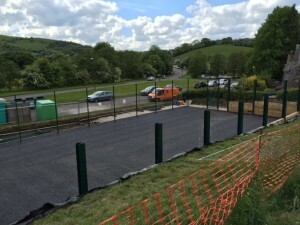 The first group on the new facility were Class 3 who could barely contain themselves when Mr Tierney and Mr Leitch opened the gates on June 9th 2015. We will be holding an official opening event on July 12th – all members of the community are welcome to join us for fun, games and a hog-roast! The governors would like to announce that Mr Simon Beahan has been appointed as the next head teacher of Curbar Primary School. 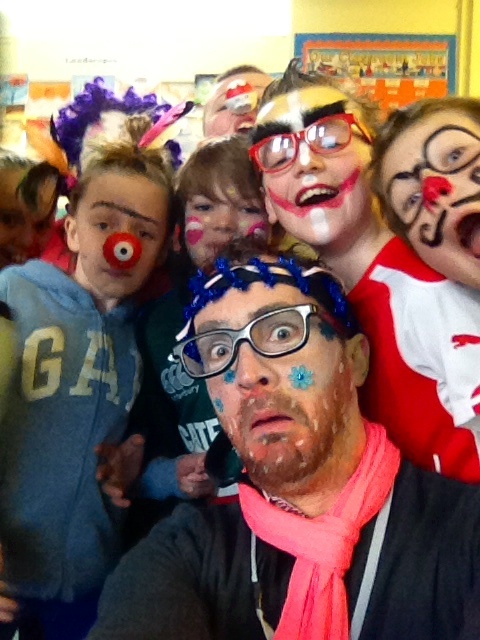 Mr Beahan will be visiting school this term (Summer 2 2015) and become head teacher in September 2015. Work on our MUGA is well underway. Picture from early June 2015 can be seen below. 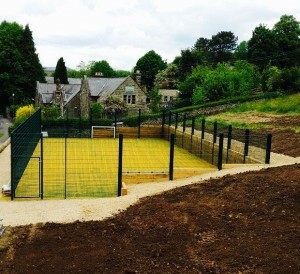 We are hoping to be able to make full use of the new facility very soon! Two teams from Class 3 entered the Lady Manners Kwik Cricket competition in June 2015. The ‘B Team’ finished in 3rd place in their competition and the ‘A team’ (participating in the larger school contest) won! The final was won by a total of 116 runs, leading to a place in the Derbyshire finals next week. Good luck! On Wednesday June 3rd, Class 1 ventured out to Eureka! They had a fabulous day, supporting their science curriculum and having fun! Freddie, a Year 6 pupil at Curbar Primary School, is celebrating after being awarded a place in the National Youth Choir of Great Britain. Freddie heard within 24 hours of his audition that he had been awarded his place! This is the latest impressive achievement by this talented young singer, who recently won his class in the Chesterfield Music Competition, and last Christmas was selected by Derbyshire as soloist to sing ‘Walking in the Air’ for the screenings of ‘The Snowman’ with orchestra at the Octagon in Buxton. Freddie’s singing teacher and Curbar School Choir leader, Kate Huddie, who lives in Froggatt, is delighted with Freddie’s progress and his recent string of successes, but will be very sad to see him leave the school choir when moves on to Lady Manners after the end of this term. He will be greatly missed! Former pupil, Eliza Youdan was invited to London for the final of the Radio 2 500 words writing competition. Eliza wrote a brilliant story about the royal family and had a great day mixing with famous people! Our school council were upset to see the devastation in Nepal following the Earthquake in April 2015. 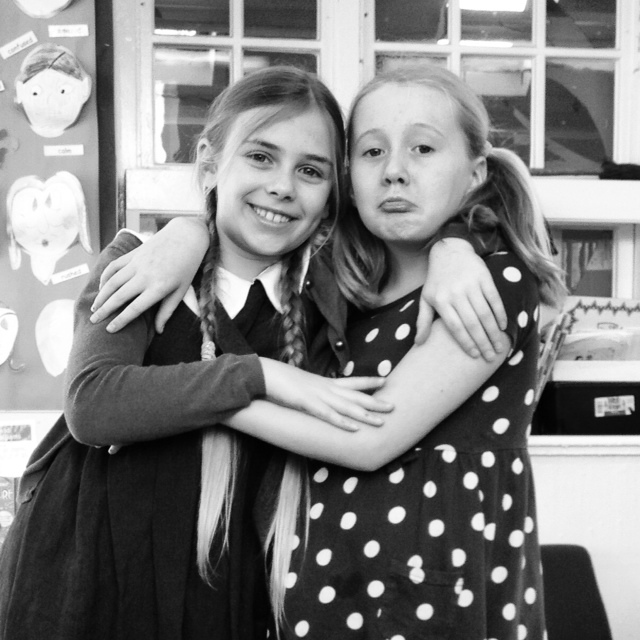 They kindly organised a non-uniform day as a means to raise funds for the people of Nepal. All money raised will be sent to UniCef for their appeal. Thank you. Our amazing choir, led by the equally amazing Mrs Huddie and Mrs Cottle, participated in Chesterfield Music Festival for the first time this year (April 2015). The choir won their category (small choir) with a distinction mark of 87. As if that wasn’t enough, they then went on to win the ‘Choir of the Festival’ trophy! The sang again at the prize winners concert on Saturday evening and were yet again, a credit to the school. A fantastic achievement for all of those involved. Well done everyone! Our Year 6 children completed their Bikeability training in April 2015. The children spent a morning learning skills and knowledge of riding safely on the roads before heading out into the local community for the second session. All children who took part successfully passed the training. Well done. 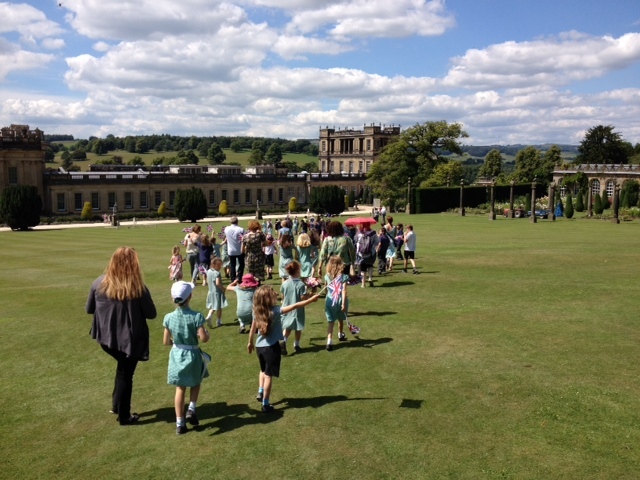 On April 23rd 2015, Class 3 visited the brand-new ‘stick yard’ at Chatsworth, where they learned about the impact of the First World War on Chatsworth Estate. The children enjoyed making memorials for the three Chatsworth men who lost their lives at Gallipoli almost exactly 100 years ago. Class 2 enjoyed a lovely sunny afternoon at Lady Manners being taught skills for rounders in April. 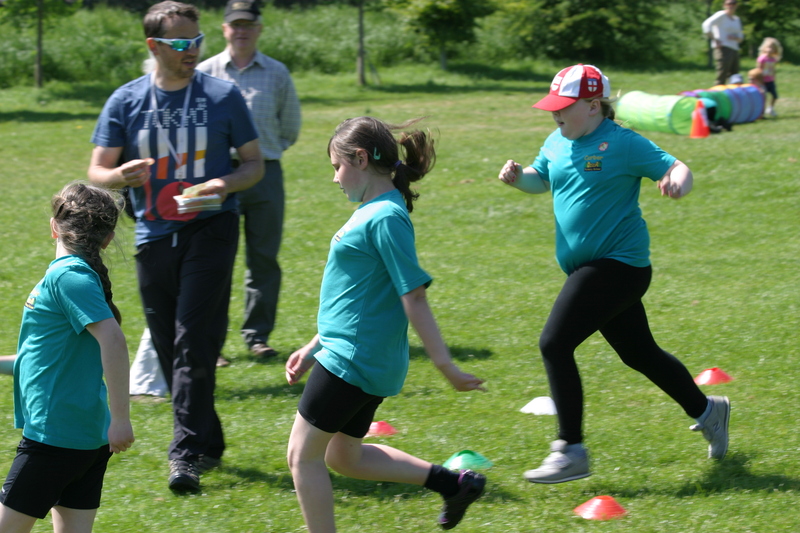 The Y11 leaders organised the event superbly and the children particularly enjoyed the games of rounders at the end of the day. On a chilly March afternoon, a squad of Y6 netballers ventured to Lady Manners for the annual netball ‘High 5s’ tournament. Despite being relatively inexperienced and playing against bigger schools, the team played really well and picked up several points. 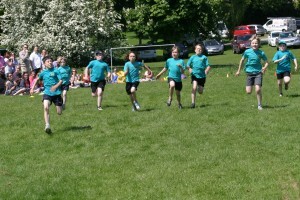 Well done to everyone for taking part and showing such good sportsmanship. 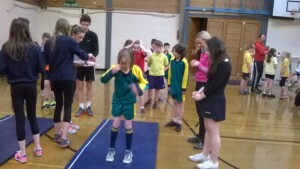 8 Year 5 and 6 childrenparticipated at Lady Manners in their annual Sports Hall Athletics. Out of 8 schools, we came 4th. The whole school had a taster Thai-Chi session on Thursday 15th January. We learned breathing techniques and control. We hope that some children will be inspired to take Thai-Chi further. On Monday 12th and Wednesday 14th January, we opened our doors to visitors from other Derbyshire schools to share ‘Outstanding Practice’. This event was organised via the Local Authority and we had been invited to participate. As ever, both our staff and our visitors learnt lots from each other and gained some valuable ideas for teaching and learning. We will be hosting a similar event later in the term. On December 18th we invited a lady from Ghana into school to engage the children in some Africa-inspired workshops. All children in the school participated in African dance and Africa art in six sessions across the whole day. Examples of the art-work produced can now be seen on display in school. Many children (and some adults) attended our Film Club showing of ‘How to Train Your Dragon 2’ just before the Christmas holidays. Popcorn was everywhere, but everyone had a great time and enjoyed the film. Thanks to Tom Lee for organising the film, and to Lucy and Helen for serving drinks and popcorn. December 16th 2014 was the date for our Infant Christmas production: The Grumpy Sheep. 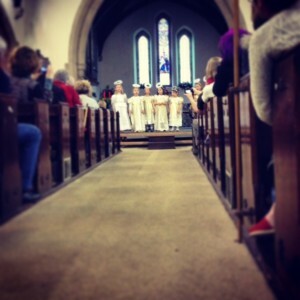 The performance was held twice and All Saints Church was packed with very impressed visitors on both occasions. Thanks to all staff and volunteers for helping to stage such a wonderful show. Thanks also to All Saints Church for allowing us to make use of the special venue. On Saturday 13th December, our wonderful choir were joined by several adults to sing carols in the village of Calver. We visited Spar, The Eating House and The Village Hall; singing at each venue. The singing received much praise and acknowledgement from the community and we raised over £75 which was donated to Sheffield Children’s Hospital. Many thanks to Mrs Huddie and all of the choir members for organising the successful event. On Friday December 12th, the whole school visited Lady Manners to watch and participate in the annual Junior School Christmas Concert. This was, yet again, a lovely event – many thanks to the staff and students of LMS! The lunchtime of December 11th was made very special by Mrs Wilson’s delicious Christmas dinner. Governors and invited guests joined us for this special occasion. Many thanks to Mrs Wilson and Mrs White for a lovely meal. The victorious Tag-Rugby LMS champions made their way to Highfields School, Matlock on chilly December afternoon for the area finals. The standard was very high and we were missing our captain, Will through illness. 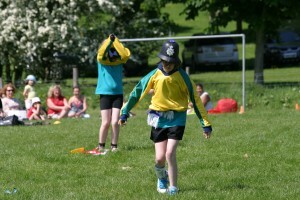 However, the team played really well and again showed excellent sportsmanship. 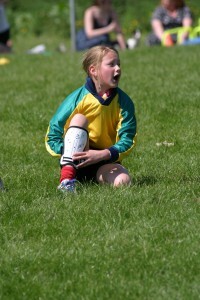 We scored lots of tries, won, lost and drew games and got very, very cold! 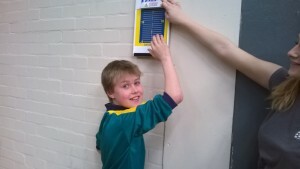 Thanks to the Derbyshire Sports Partnership for a well organised tournament. 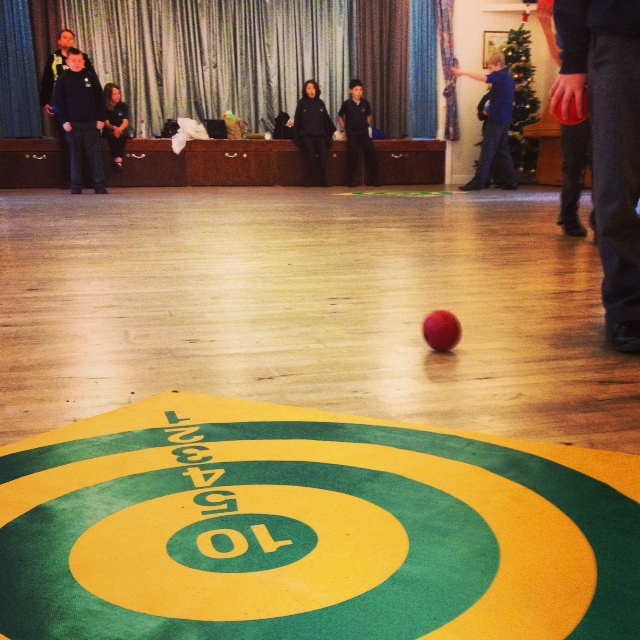 On December 4th 2014 all of the children and staff took turns to visit the Village Hall where we had a taster session for Crown Green Bowls. June and Vic Poke from Bradwell taught the children bowling skills whilst PCSO Ian Phipps spoke to the children about Stranger Danger. The sessions were all great fun but Mr Tierney discovered that bowling is a lot more difficult than it looks – he didn’t hit the target once! Miss Gregory planned and led an after school session for parents on Drugs Education in December. The curriculum coverage was shared and advice was given to parents. 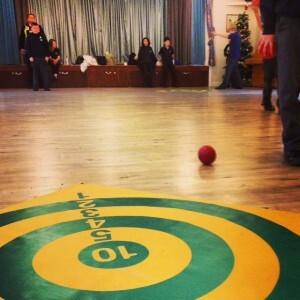 This term, we delivered some of the RE curriculum in one day in early December. 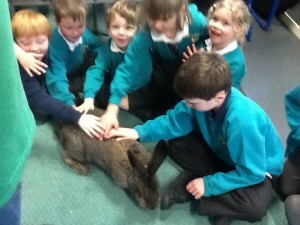 We invited several visitors into school to make the experience as real and relevant as possible for the children. Mr Halford visited the children to speak about Christianity and the Christmas story; Mrs Chapman spoke to all children about the Humanist Association and Mr Khan spoke about his recent pilgrimage to Mecca. By the end of the day, the children were buzzing with many different ideas. Further RE days will be planned later in the school year and we are seeking to arrange further visits and visitors to enhance this learning. On November 28th Class 2 were visited by Mr Wallace from Lady Manners who delivered a Unihoc session. Once again, this was very enjoyable and a great link between the two schools. Thanks to Mr Wallace. 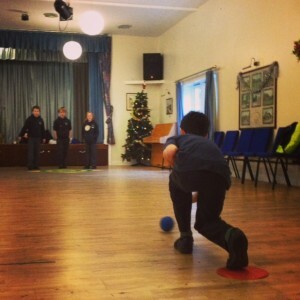 Children from Class 2 & 3 visited LMS as part of our sporting-provision in late November / early December. The older pupils (sports-leaders) from LMS taught the children gymnastic skills and our children enjoyed the opportunity to use the gym equipment of a secondary school. Thanks to Lady Manners for organising the sessions. The Rugby-coaching company ‘ Rugger-Eds’ came into school on November 27th to give all children a rugby-coaching taster session. The children all seemed to enjoy the experience and now have an opportunity to join an after-school club in the new year. Forms have been sent home but if you need another, please ask. Our wonderful instrument players from Y4&5 gave a fabulous performance on November 17th to the rest of the school and their parents. The children showed us all just how far they have progressed under the guidance of Mrs Edwards and we were all suitably impressed. Further demonstrations will be arranged later in the school year. 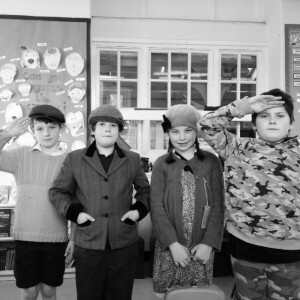 On November 14th we combined some fund-raising for Children in Need with learning out our heritage and the events of World Wars One and Two. We arranged for local author Peter Miles to come into school and talk to the children about his book which explores various stories of local involvement in the First World War. 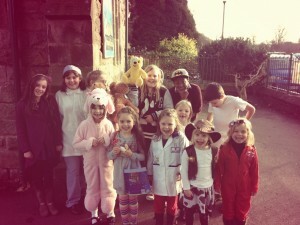 Children (and adults) dressed up in appropriate costumes and we raised over £100 via donations. The day was an odd combination of fun, respect and learning but we are glad that we took this opportunity to discover more about our history. A session to share information and discuss safety issues associated with using the internet was planned and delivered for November 11th. If you were unable to attend but would like to receive the information, please look out for the repeated session (later in the evening) later in the school year. The inaugral Curbar Commotion was held on October 5th 2014 with a fantastic 210 runners taking part. Please visit http://www.gritstoneseries.co.uk/2014/09/curbar-commotion-series-event-update/ for details. Well done and congratulations to everyone for helping to organise this fabulous event. 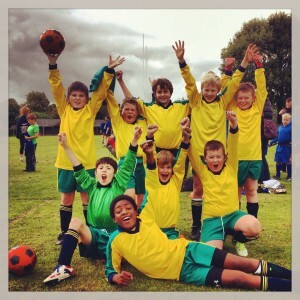 The first major sporting event of the school year took place on September 17th 2014 at Lady Manners with Curbar entering a ‘small school’ team into the ‘large school’ football tournament. After resounding victories over Baslow, Longstone and Bakewell, our team faced Tideswell in the grand final. Despite losing the final to a very strong team, the squad performed superbly and we are very proud of them. Well done! Welcome to a new school year and special welcomes to our 9 new Reception children and 5 new starters in other year groups. Everyone seems to have settled back into school life quickly and there are lots of signs of hard-work and happiness. 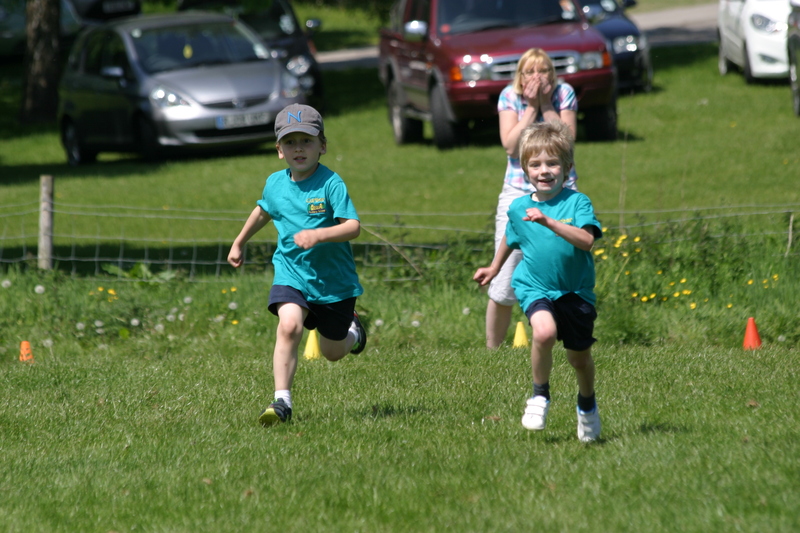 We successfully organised our sports day on the second attempt on Tuesday 22nd July. The sun shone and the warm weather (plus the prospect of a fully entertaining sport spectacle!) attracted a huge number of supporters. 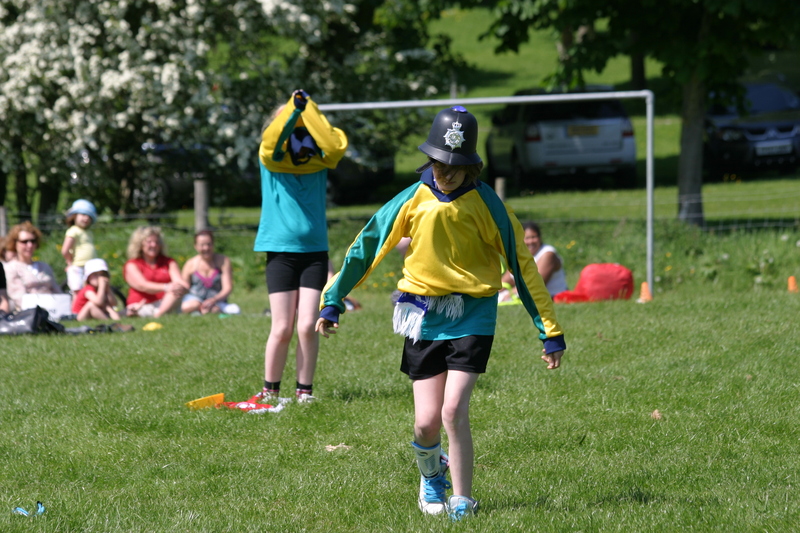 The children all competed really well and also enjoyed the ‘just for fun’ races, including the very entertaining Year 6 dressing up race (see pictures below). 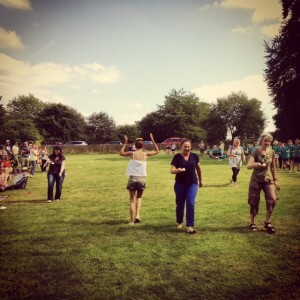 So many adults wanted to join in the races that we had to have three separate adult events, including one just for staff. 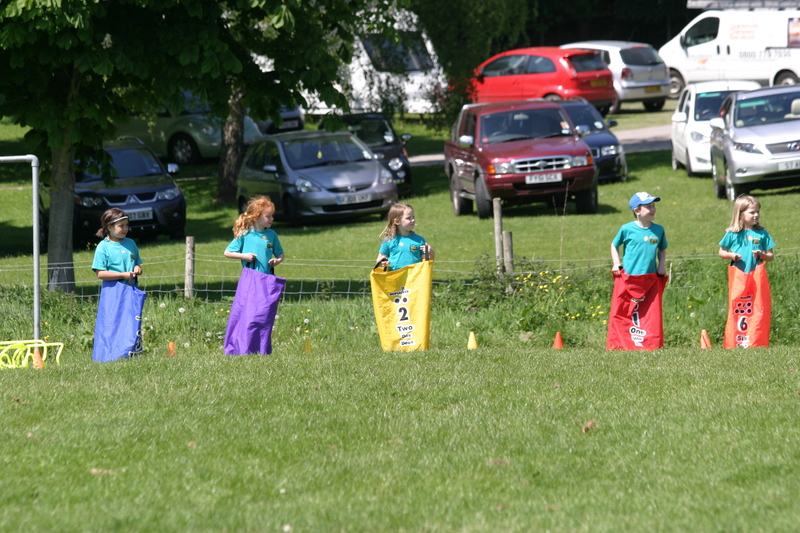 The toddler race was also a success and everyone had really good fun. Congratulations to ‘Summer’ house for collecting the most house points during the afternoon. Thanks to all staff and volunteers for their help and support. Spring house were the top of the charts at the end of academic year 2013-14. Congratulations to everyone for working hard to earn house points. They will all be visiting Graves Park in Sheffield for a picnic and a play on the last day of term. Miss Gregory and Miss Pattison very kindly organised and led a group of 17 children on a residential trip to Stratford Upon Avon. They participated in a drama workshop at the RSC; spent time exploring Shakespeare’s House and spent a sunny day enjoying Warwick Castle. Everyone cam back to school tired but full of enthusiasm. Thank you to Miss P and Miss G for their time and efforts to enable the children to have such a great experience. 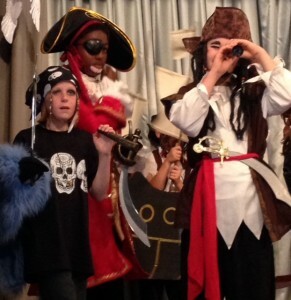 This year’s end of year production, ‘The Pirates of the Curry Bean’ was a great success. 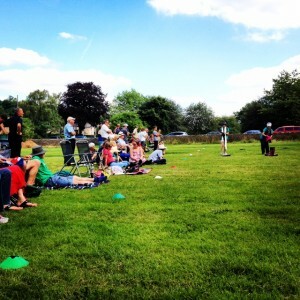 We produced two performances on Friday 11th July 2014 at Calver Village Hall. The children performed incredibly well and the audience laughed and cheered in all of the right places. Many thanks to everyone involved including staff, parents and members of the community. Well done to our wonderfully dramatic children! 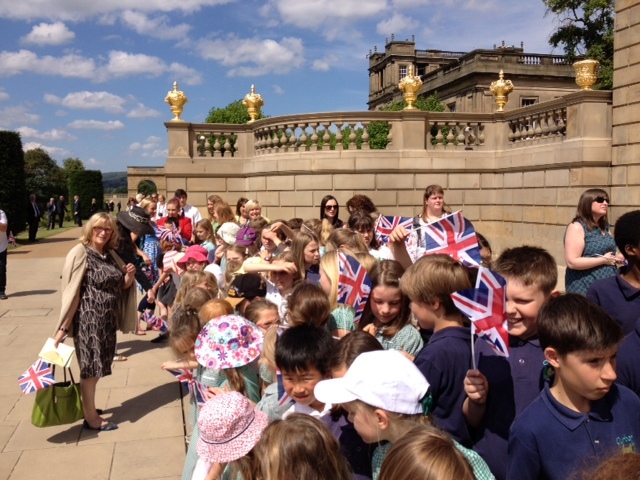 In July we were invited to Chatsworth House to meet Queen Elizabeth II. We were all very excited and the sun shone as we spent a lovely afternoon waving flags and feeling patriotic. Below are some photographs of our special day. 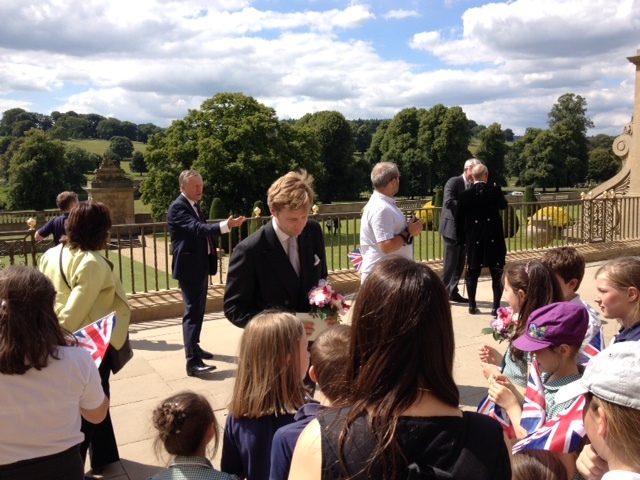 We spent some time in the gardens before heading down to meet The Queen. Waving goodbye to Her Majesty as she departs in her helicopter! 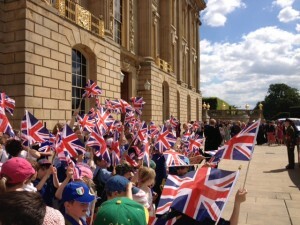 Waiting outside Chatsworth House for The Queen. Meeting Lord Burlington who collected posies and cards for Her Majesty. We waited patiently but excitedly in the sunshine. 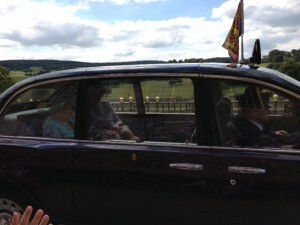 The Queen drove past us on her way to her helicopter. This year’s PTFA BBQ was rather wetter than the previous year, with the clouds deciding to open an hour before the start of the event. However, the turn-out was still very good and we improvised with World Cup Football, a book and plant sale and karaoke. The event was great fun and enjoyed by all. Many thanks to the PTFA for their great organisational skills once more. On July 3rd we invited parents to attend an internet safety session. We held a useful discussion around esafety issues and key information was shared. Any parents who were unable to attend the session are welcome to request some of the documents shared. 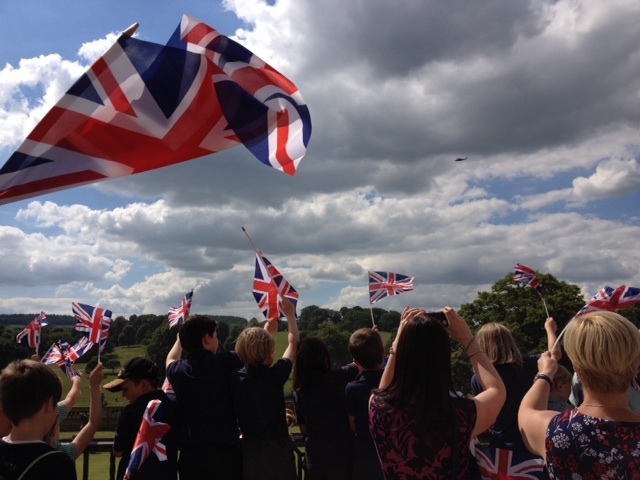 On July 2nd 2014, Mr Tierney announced that the whole school are going to meet Her Majesty Queen Elizabeth II. 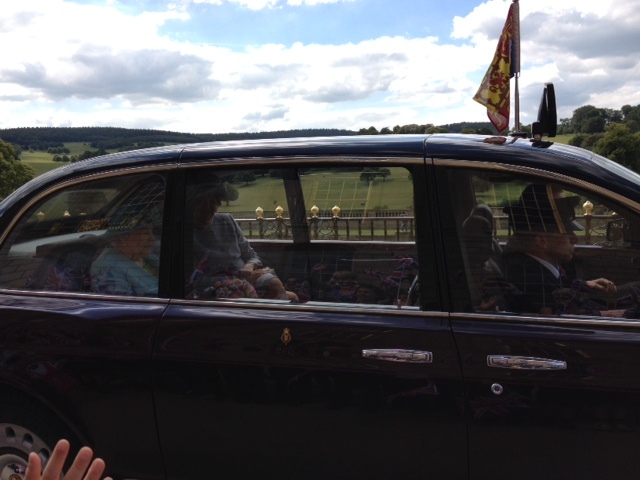 We have been invited to Chatsworth on July 10th 2014 to meet The Queen during her visit to Derbyshire. Watch this space to find out all about it! 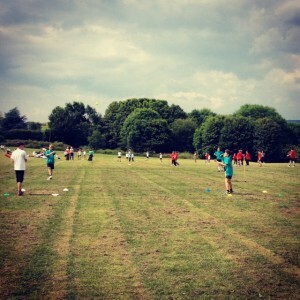 On July 1st, a squad of rounders players from Class 3 participated in the LMS rounders competition. Despite officialy being a ‘small school’, we opted to join the ‘large school’ competition as a challenge. Out of the 10 ‘large school’ teams in the competition, Curbar came a superb 2nd. Well done to everyone involved! For the second year running, our choir entered the Bolsover Choir Festival. This year, due to the hard work of Mrs Huddie and members of the choir, we earned a ‘Silver’ accreditation. June 2014 sadly marked the end of the weekly whole-class clarinet lessons with Mrs Ford. Parents were invited into school to see the children perform musicianship and clarinet pieces. The good news is that we have decided to conitnue clarinet lessons for Y4&5 next year in smaller groups. Sue Edwards will commence these sessions in September 2014. 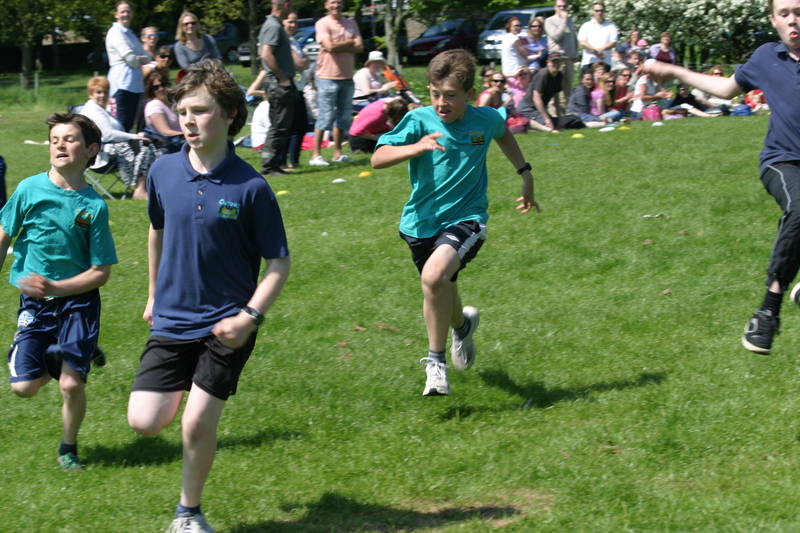 On Wednesday 11th June 2014, we organised our annual Sponsored Run. 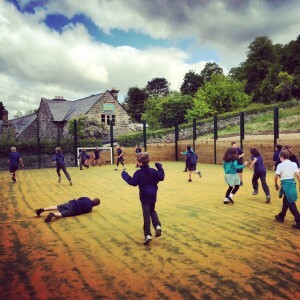 We were kindly allowed to use the grounds of Cliff College and chose a route to challenge the children! The outcome was very impressive, with all of the children covering a really great distance. Thanks to Cliff College for the grounds and to everyone for supporting the event via sponsorship. Sponsor Money will go towards the MUGA. Miss Pattison and Miss Gregory arranged for a team of engineers to enter this year’s design challenge on June 7th. The team designed and built a catapult and successfully fired a weight over 7m. The team came 2nd overall and were delighted with their performance – the engineers of the future! 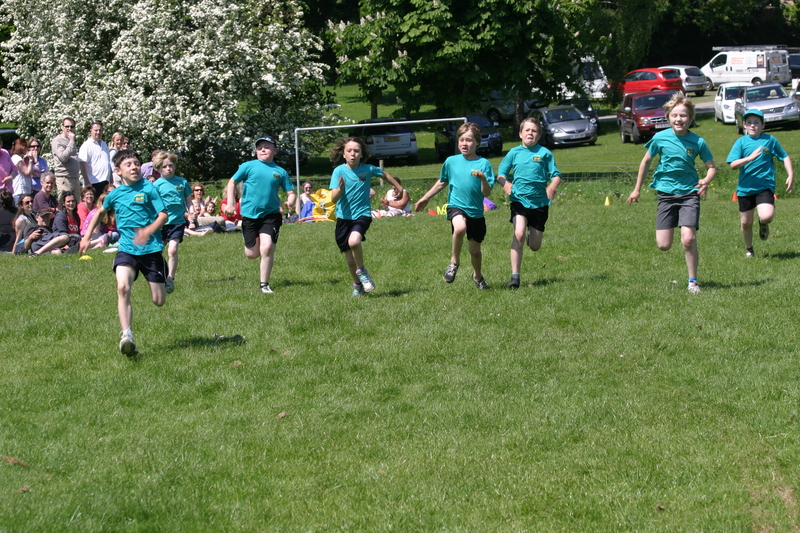 Huge thanks to Miss P and Miss G.
A squad of Year 6 children participated in the LMS cricket tournament in early June. Two matches were played against local schools with Curbar winning both matches – scoring over 100 runs in one of them! 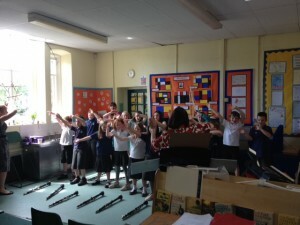 Mrs Huddie and our wonderful choir chose to arrange a Flash Mob in Bakewell on May 23rd. 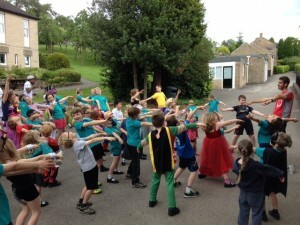 The children performed ‘Puttin’ on the Ritz’ in front of many people, both tourists and locals in two locations in Bakewell. Money was collected for the MUGA fund and the children had a fantastic experience. This year’s art show was a huge success with over £3,000 raised towards PTFA funds. Further information will be added to the Art Show page on this website. 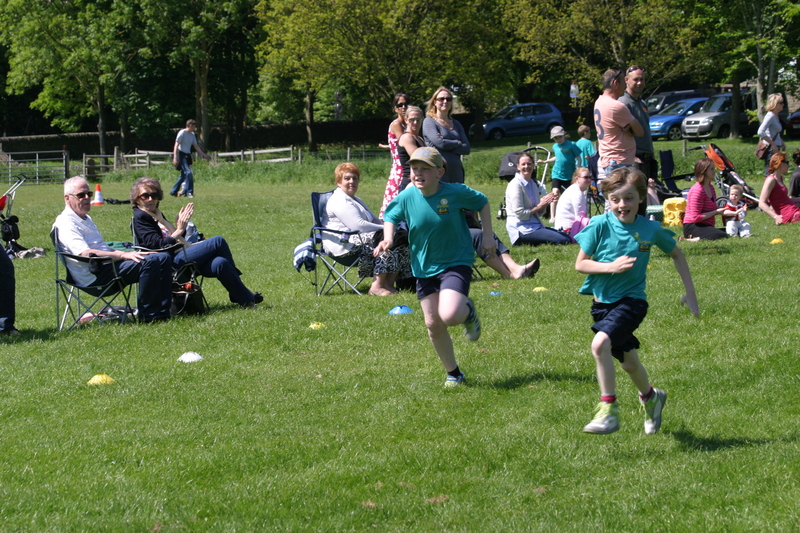 On May 7th 2014, Year 2 children all took part in the mini-rounders festival at Lady Manners school. Well done everyone! We have been working alongside Naomi Baines to learn and perform pieces to commemorate the anniversary of the start of WW1. 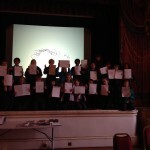 On Sunday May 4th, children in Class 3 were given the opportunity to perform at Buxton Opera House. 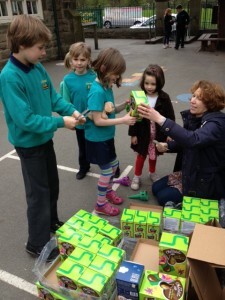 Unfortunately, many families were busy due to the bank holiday weekend but we did have representatives from the school. 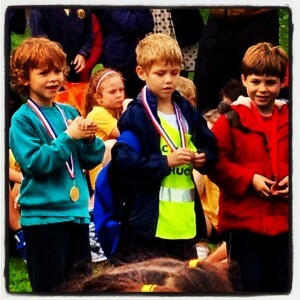 Well done Harry! Our Year 6 children received further training from the Bikeability team. 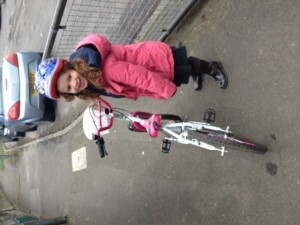 Two sessions were completed and the children will now feel more confident at riding their bikes on the roads safely. Our brilliant PTFA organised another Easter Egg hunt this year. 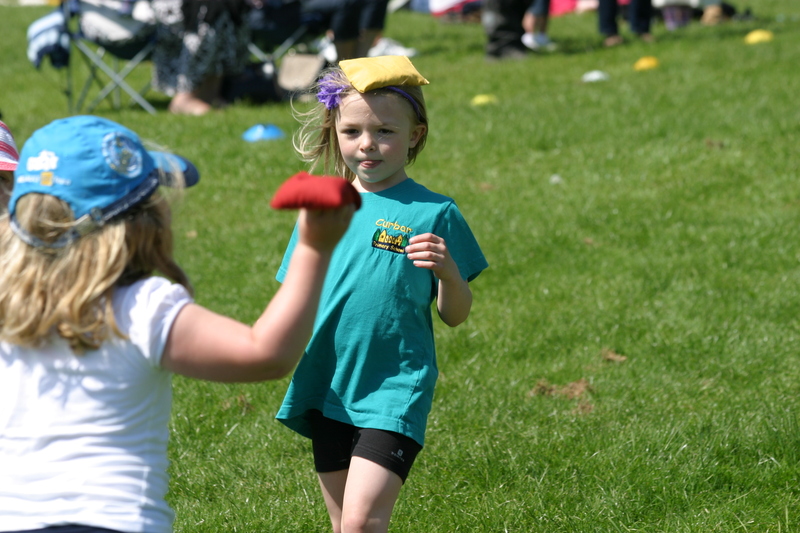 We all had great fun hunting around the school grounds for Easter treats – it was lovely to see the older children looking after the younger children in such a kind way. 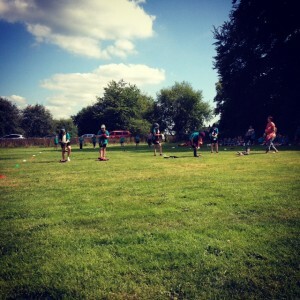 A squad of Y5 and Y6 children played in the Lady Manners netball tournament on April 9th. Mrs Berry was delighted with the performance of the children and they played really well. 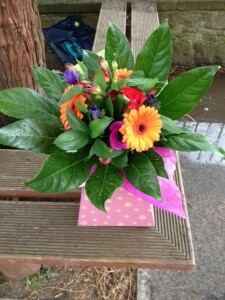 On behalf of the PTFA, Sophie Fletcher very kindly made and sold many many of these beautiful bouquets. 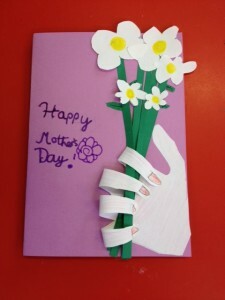 The children made some lovely cards to tell their mums just how much they are loved. 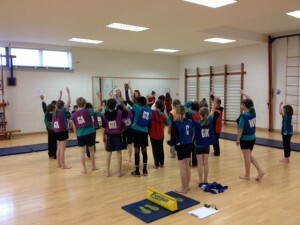 Children in Class 3 have been visiting Lady Manners to help the Year 11 Sports Leadership students with their learning. The first session involved indoor athletics and the second session covered rounders. 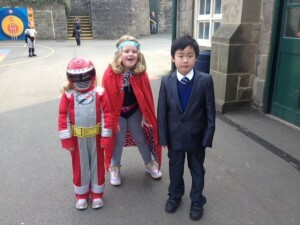 THE BIG PEDAL AND SUPERHERO DAY. We decided to take part in the full ‘Big Pedal’ this year, which is an event organised by the charity Sustrans. 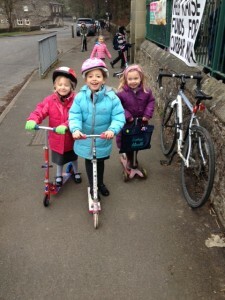 All children (and adults) were encouraged to cycle or scoot to school rather than using their cars for the two weeks starting on Monday 3rd March. 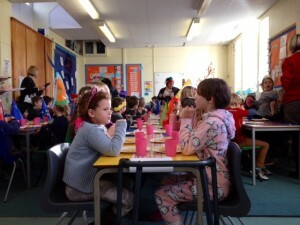 Lots of people were able to take part and we enjoyed dressing up to celebrate the event on its last day. There were many superheros around the school on Friday March 14th but lets be honest – there are superheros in our school everyday! 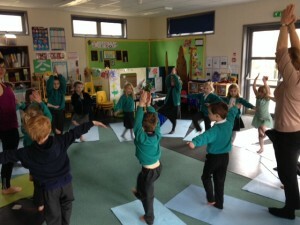 Each class was provided with an hour’s ‘Rainforest Yoga’ on March 12th. 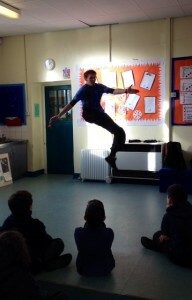 We asked a local yoga teacher to come into school and teach each class some yoga techniques on a theme of ‘rainforests’. It was a great experience for everybody. 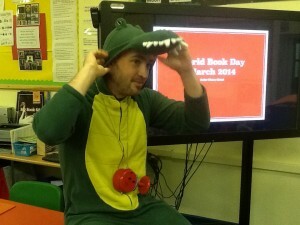 Tuesday 6th March was World Book Day. Everyone in school was asked to dress as a character from a book. Many adults chose to dress as characters from Peter Pan – Mr Tierney looked rather odd on the playground dressed as Tick Tock the Crocodile! 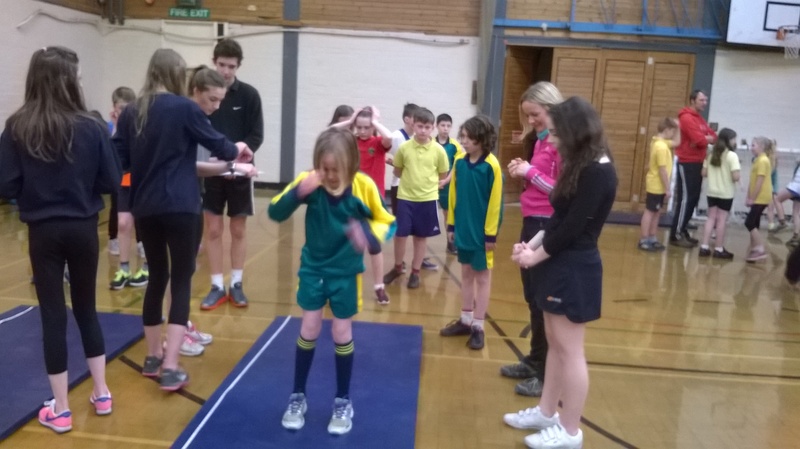 Class 3 took part in Sports Hall Athletics at Lady Manners School on February 26th. 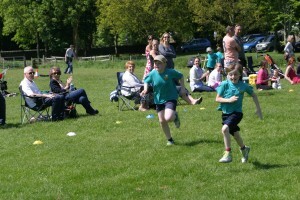 The children had great fun and finished 3rd overall in the competition. Well done everyone! On February 25th, we launched our first ever ‘cinematography club’. The children who are taking part (after school on a Tuesday) are learning about filming and film making with the company ‘Imaging Partnership’. 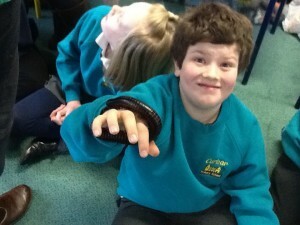 On February 25th Class 1 and 2 were visited by many rainforest creatures. 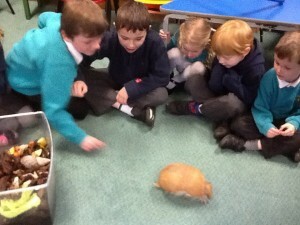 Oreo and Friends brought in a range of animals, including a giant millipede and a honey bear! 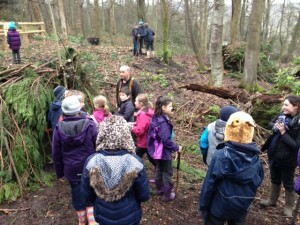 Class 3 were invited to Chatsworth to take part in some forest school activities on February 6th. 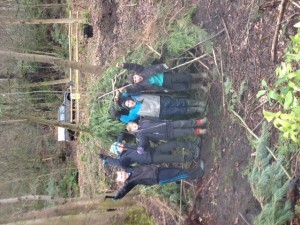 Fortunately, the weather was kind and they had a great time building dens and learning about traditional forest crafts. As part of the Wider Opportunities Music Partnership work, Class 2 performed a clarinet and musicianship concert on February 6th. The parents were amazed at how much the children had learned in a short period of time and they are very much looking forward to the next concert. On January 31st Class 2 were visited by Andrew Battye of the Peak National Park for a session on biodiversity. The session linked with the class’ topic of ‘Rainforests’ and the children produced some fabulous work. 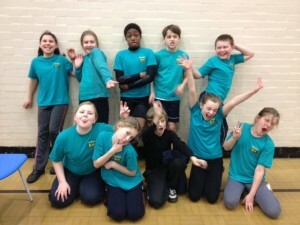 On January 29th, a group of Year 6 children took part in a basketball tournament at Lady Manners School. The children performed brilliantly and showed some excellent team spirit. Well done everyone! Class 3 were visited by two ladies who work for the NSPCC. They discussed difficult issues and different ways of tackling the problems that some children face. It was lovely to hear our visitors comments about how well the children listened, contributed and worked together during the sessions. 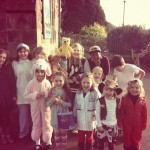 On November 15th, the School Council decided to ask everyone to dress up as ‘what they’d like to be when they are older’. There were some fabulous costumes with a range of ideas including super-heroes, surgeons, vets and sports-people. Even the staff dressed up, with Mr Tierney dreaming of playing for Man Utd and Mrs Berry just dreaming (in her dressing gown!). Well done to everyone for raising over £79 for a great cause. In October, Class 3 were lucky enough to be able to visit Chatsworth gardens and work alongside artist Laura Ellen Bacon. 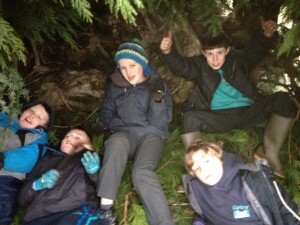 They enjoyed exploring ‘spaces’ and thinking of creative ideas for dens and private spaces. 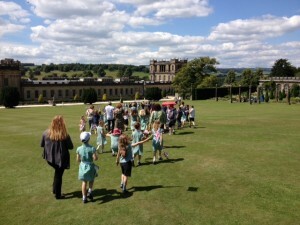 We are going to be working alongside Chatsworth to develop more opportunities for outdoor learning. In November, Class 3 took part in the annual Tag Rugby competition at LMS. The team played superbly and won both of their matches, crowning us champions of the Mini-School tournament!! Mr Tierney wasn’t the happiest head teacher however when he collected 6 very muddy individuals to transport them back to school in his van! Well done to all involved. On October 4th 2013 the whole school excitedly boarded a double-decker bus and journeyed to Lady Manners for the annual cross-country event. All of the children performed superbly and tried their hardest. Morgan received a huge cheer when he finished the infant race in first place. 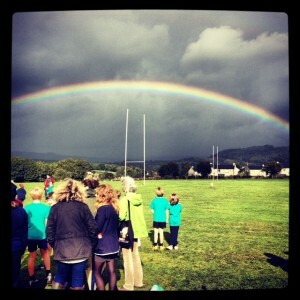 We are very proud of all of our children for having a go, despite the changeable weather! Nine boys from Class 3 took part in the first Lady Manners football tournament on September 18th 2013. The tournament was organised into ‘Micro’ ‘Mini’ and ‘Midi’ schools with Curbar being in the ‘Mini’ category. Three matches were played by our squad and we successfully won all three: scoring 36 goals and conceding 0! Well done to all of the boys involved! The children and staff returned to school with smiling faces for the start of the new school year in September. Everyone was very excited to see the new carpets and decoration in the entrance corridors and Mr Tierney was a little too excited about the new shelves in the stock room! On July 3rd, Nathaniel’s mum (Josephine) very kindly came into assembly to tell the children about Chinese creation stories. The whole-school loved listening to her tales and asked lots of interesting questions. Thank you Josephine – a Head teacher’s award for you! Class 3 were engaged in a reading project with Lady Manners School on Friday June 28th. Please click here for details of what they got up to. On Wednesday June 19th, our marvellous choir participated in the Bolsover Choir Festival. More more details please click here. On a sunny day in June, we had a few thousand visitors to School House garden. No, we really did! 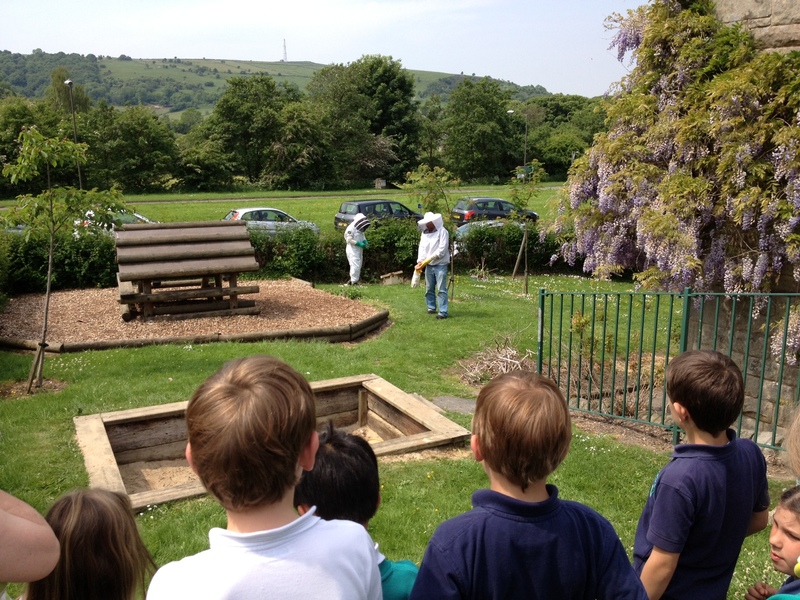 A swarm of honey bees had found a cosy branch in the hedge and were buzzing with excitement as we wondered what to do… Very fortunately and rather oddly, the week before, Mrs Bingham had chatted to a man outside school who was in search of bee swarms. She had taken the man’s phone number and within 5 minutes, he was on site and teaching us all an interesting lesson in insect bee-haviour (sorry!). 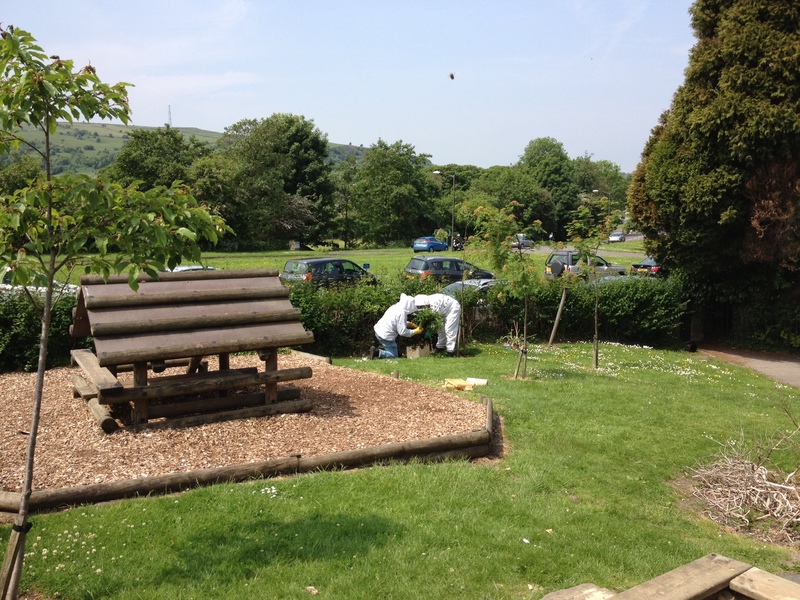 A very pleasant lunchtime was spent by staff and children alike watching two experts remove the swarm, box them up and take them away. See for yourself in our Bee video The swarm are to be re-hived in Cliff College apiary and the hive is to be named after our school. How cool is that? 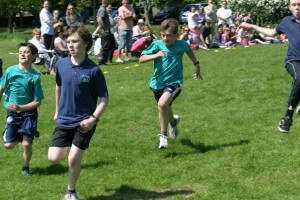 Sports Day this year was a great success with the sun shining on us at Cliff College field. 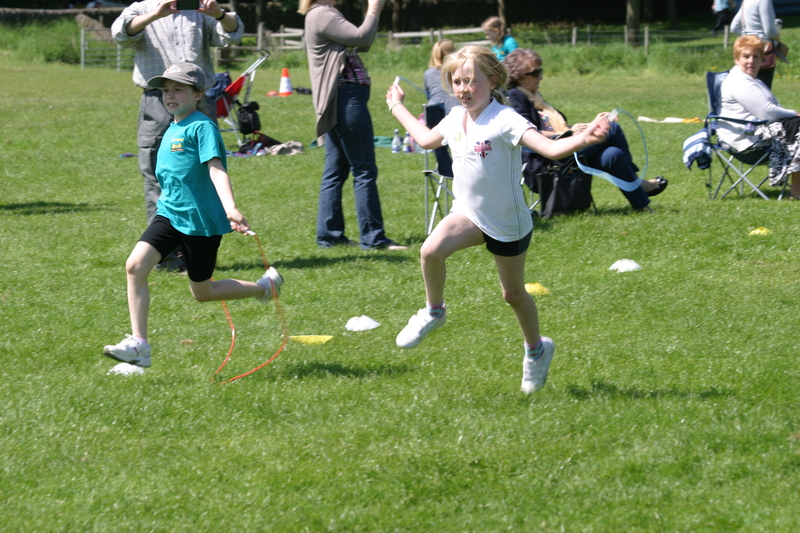 The children all worked in their houses on a carousel of four activities before taking part in the competetive and the fun races. Over 1600 House Points were given out by the generous staff. Spring house were the overall winners with a ridiculous 435 house points! Thanks to Cliff College for the use of their grounds. 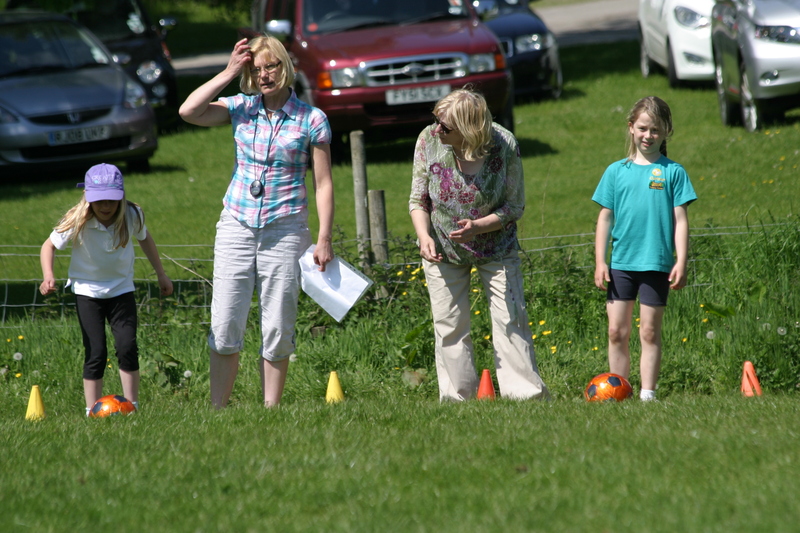 CHILDREN, STAFF AND FAMILIES HAVING FUN ON SPORTS DAY. PHOTOGRAPHS COURTESY OF JOHN DIX. Miss Pattison ventured into the world of adult learning in June to teach parents the maths strategies that their children are taught in school. The parents were all very well behaved and made good progress. We are very proud of them! Thanks Miss P! 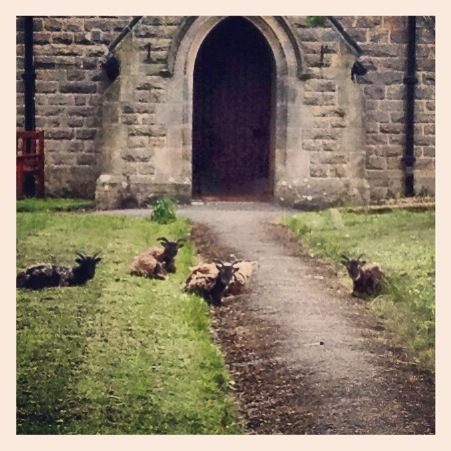 In June we were surprised to find five little visitors in the church yard next to school. After much debate, the staff decided that our new friends were goats, not sheep. Added security has been provided for Miss Gregory’s vegetable plot! 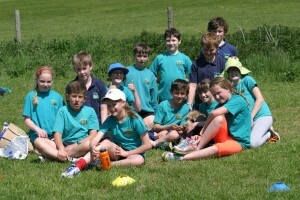 A team of cricketers from Class 3 visited Lady Manners to take part in a Kwik Cricket competition. 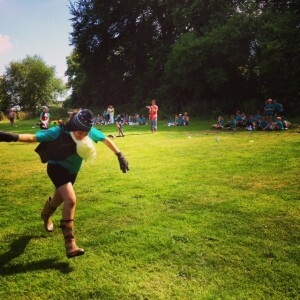 Three matches were played with the team winning the first and narrowly losing the other two. All children played really well and received certificates for their efforts.